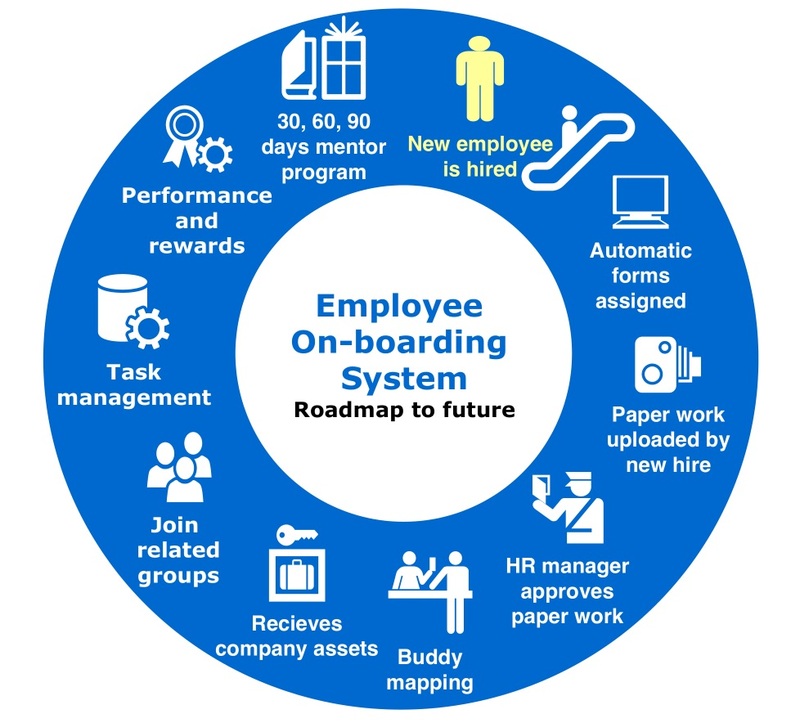 An employee on-boarding system that can be best compared to an employee roadmap towards a successful future. Creative Social Intranet has now extended its wings and moved towards an ultimately crucial on-boarding experience with the ongoing growing demand for a better employee on boarding portal. Creative Social Intranet aspires to be a solitary gateway for all your HR and company processes online. 24*7*365 client email support and more. The next move at Creative Social Intranet is launching an employee e-learning and on-boarding application to build an amazing employee journey for new starters, transitioning employees and leavers. We aim at a fast offer creation and convenient digital acceptance that will streamline the essentials of on-boarding in a way that your people and fresh starters will adore. So let’s see how will the Creative Employee On-boarding application roadmap be like? a) Firstly the new employee gets hired by the recruiter and then he joins the company..
c) The new hire forms and related forms are automatically assigned through the on boarding system. d) Once the new hire completes paper work by uploading needed documents, the HR manager immediately gets a notification to check and verify. e) The hiring manager then approves the paper work and then the trainee is guided by the On-boarding application to read the policies and respective e-learning and training. f) The new employee gets skillfully mapped with a buddy for support and communication. g) The new joiner can mark the list of assets assigned and received through the asset form checklist. h) He can join various existing groups like New hire club, Freshers group or groups where he is invited by his managers. i) Build good relations and connections with his colleagues and managers through the portal and also get daily, weekly, monthly tasks from the task management system. j) The managers can monitor his performance from the performance report and can provide required guidelines, mentoring and training. The new joinee while starting the job needs various forms, online checklists etc. With the form management application, you can create these. Form Management applications are required both by the Recruiters as well as the new joinees. Form management application also helps in employee retention and develops auspicious employer branding. With the task management application, it is easy to assign daily, weekly, monthly tasks that give regular notifications via email or messages about task completion, in progress or delay of the task. Again, one task can be allotted to multiple users. Task Management and Performance management applications are required both by the HR managers and New joinees. Task management application help in reducing complaints, help desk trouble ticket requests and improves work flow and productivity. The performance management application can be designed for a 30, 60or 90 days period performance management reports and be followed by respective mentor programs. Socializing through employee dashboard is can be made easy. Socialization is needed for the new joinees to connect and communicate with the HR manager and existing employees and their immediate heads. It helps building connection, develop trust and confidence towards the company. Companies can create new hire clubs for example there’s a group on Creative Social Intranet for the new joinees. Now let’s explore the need for a better employee on-boarding application program. The below statistics are based on a poplar survey . These clearly state the need for an automatic digital on boarding program. 25% of staff turnover occurs within its first 45 days of joining. Automating on-boarding leads to 16% higher retention rates for new hires worldwide.